There aren't many concertos for harp and orchestra. Among the existing ones, some are well known and oft-played, such as those by Mozart, Debussy, Rodrigo, Glière, Saint-Saëns, Ginastera, Grandjany, and Boïeldieu. A few more, by composers like Donatoni or Shafer, are less so. It's a short list by any instrument's standards. 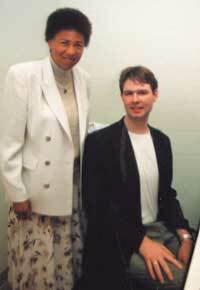 But the list is larger by one since the 1999 composition of the “Concerto for Harp and Orchestra” by Kevin Kaska. Even better, this concerto was commissioned by the Boston Symphony Orchestra’s longtime harpist Ann Hobson Pilot, so her colleagues can be sure that it lies well under the fingers and has good pedal markings. In 1995, barely graduated from the Berklee College of Music in Boston, Kevin Kaska found himself in front of a harp for the first time when he helped jazz harpist Deborah Henson-Conant with some harp and orchestra arrangements for an appearance with the Boston Pops. He gained valuable experience through Henson-Conant’s tutelage, and became familiar with using enharmonics and certain scales, and how to make them by changing the pedals. BSO assistant conductor Ron Feldman’s wife, harpist Elizabeth Morse, gave him some over-the-phone assistance, as well. Like most orchestral harpists, Ann Pilot has spent many hours with orchestra harp parts trying to make them playable, so when in 1997 she was given a well written part in a piece called “Wizard of Menlo Park”, composed for the Boston Pops by Kevin Kaska, she knew she had found a composer who was knowledgeable about her instrument. Indeed, continuing his learning process, Kaska had obtained a copy of the very useful book by the late Stanley Chaloupka, 40-year harpist with the Los Angeles Philharmonic, called “Harp Scoring” which had provided many more clues in unraveling the mysteries of the harp. With all this new information and some harp writing behind him, the now harp-loving Kaska was ready to try a harp concerto. Coincidentally, Ann Pilot had been looking for a “rhythmic” concerto and approached him about it. “If you’ll commission me to write the piece,” he told her, “I have a friend at Denouement Records, president Cliff Schorer, who will finance the recording of it. ”She did, and they got to work. Dates were set. Abbey Road Studios was booked. The London Symphony Orchestra musicians were hired to record the concerto. Kaska went back to the sources, especially to the method books to study musical patterns that work well on the harp, and for more enlightenment about the pedals. Pilot brought him music by 20th century harpist, composer and innovator Carlos Salzedo and a recording by Salzedo expert Lucille Lawrence, which opened up a different world of harp sounds from the Henson-Conant jazz. Kaska was so fond of Salzedo’s “Scintillation” that he incorporated part of the sound into the second movement. After working with Pilot for some months he commented, “I didn’t realize that some of those Salzedo techniques were not that difficult to play. When I was writing them, it took some time to decipher all the scales and notate the right markings. I thought they were going to be difficult for Ann, but she’s able to play them beautifully while making them seem effortless. ”Later, Pilot remarked that, despite appearances, the entire concerto was a challenge. The London recording session was four months away, in September 1999. It was time to get to work. Kaska began the first movement, writing at the piano, keeping in mind the harpistic patterns he had studied. He sketched his work onto music paper and entered it into his Finale music writing computer program. Then he recorded it from his synthesizer and presented the tape and the printed copy to Pilot. Some of the pedal changes were wrong or inconvenient…he’d written a note on a non-existent string at the low end…too-close octaves were muddy sounding and needed separating. But once needed changes were made…Pilot was very pleased! Time to move ahead. Most concertos are in three movements in the order of medium-slow-fast. Kaska started the second movement, but when it sounded “happy” he realized that he’d slipped into a third movement mood. He went with the flow and continued with the third. This movement turned out to take the most time to compose, as he envisioned fireworks and guitar-like strumming, and a cadenza. The harp was to play throughout the movement, so the writing was extensive. 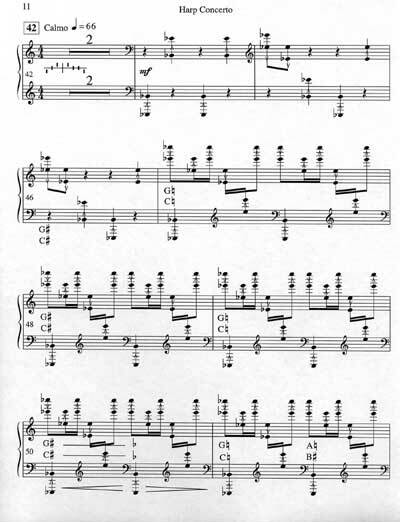 In this excerpt, a dotted quarter-note = 64. Two months passed, and Ann Hobson Pilot left for the Boston Symphony’s summer home at Tanglewood in the Massachusetts Berkshire Mountains. There she showed the completed sections to the venerable Lucille Lawrence, for years the Tanglewood harp instructor, who had many suggestions, and they worked together editing the first and third movements, simplifying, clarifying. 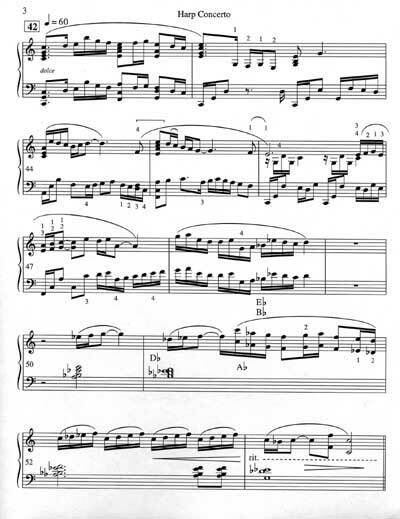 Meanwhile, back in Boston Kaska began writing the second movement again, and remembered how attracted he had been to the middle section of “Scintillation” with its shimmering glissandos. 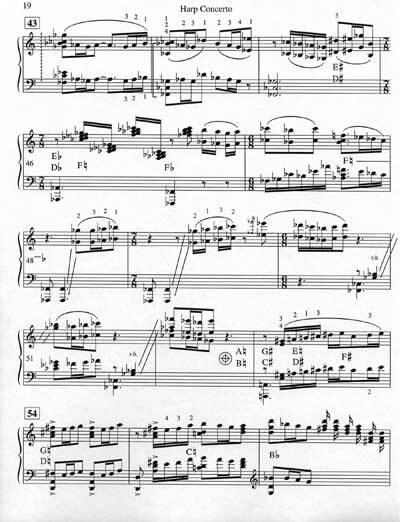 A new key would be nice, he thought, but he ran afoul of the pedaling idiosyncrasies which would not allow him to produce the same combinations in a different tonality, so he returned to Salzedo’s own key. Kaska remarks, “I guess that’s why he put the piece in that key. It works best there for that kind of harmony and those pedal changes. ”The second movement of the work was dedicated to Salzedo, and pays homage to the scintillating sounds he had invented. Kaska finished the harp part just one month before the recording date, leaving Pilot barely time to learn it, and himself barely enough time to write the parts for the 55-piece chamber orchestra. Ron Feldman and Pilot recruited some Boston Symphony players for a run-through at Tanglewood. More editing. Then a mad dash to London. The concerto is currently available to anyone who wants to buy the harp part or rent the orchestration; contact info@denouementrecords.com. For those wishing to hear the concerto, Ann Hobson Pilot’s CD can be purchased at http://www.denouementrecords.com.